The name "Stickley" is a well-known one in antique furniture circles - an avatar of Arts and Crafts design. But there are in fact two major sets of Stickley furniture-makers: Gustav Stickley on one hand, L. & J.G. Stickley on the other. Relatives and rivals, they were often confused, even in their own lifetimes. The most famous member of the clan, Gustav Stickley (1858?-1942) was a furniture maker, architect, and publisher. Through his designs and magazine, The Craftsman, he became the leading proponent of the American Arts and Crafts movement . Based in Eastwood, New York, his company manufactured furniture, metalwork, and textiles from 1900 to 1916. He dubbed his style "Craftsman," though it is often referred to as "Mission" or "Mission Oak." The initials refer to two of Gustav's younger brothers: Leopold (1869-1957) and John George (1871-1921). After working with Gustav for a time, the pair joined up to start their own factory in Fayetteville, New York in 1902. They coyly refused to identify their design style, calling their pieces "just simple furniture on Mission lines." Yet they were clearly following in big brother's footsteps. In fact, in a 1907 catalog, Gustav Stickley warned that "some of my most persistent and unscrupulous imitators bear the same name as myself, and this fact is used to confuse purchasers," as David Cathers recounts in Furniture of the Amercan Arts and Crafts Movement. Eventually, Leopold and John George were able to openly reproduce Gustav's pieces. In 1916, Craftsman Workshops failed, and Gustav was bought out by his younger brothers. The conjoined company was briefly known as Stickley Associated Cabinetmakers, and then the Stickley Manufacturing Company. In 1974, this firm was acquired by E.J. Audi, one of its dealerships - which, under the name Stickley, Audi & Co., reproduces and creates modern adaptations of all the Stickleys' designs. The younger brothers' furniture "has long been considered of secondary importance," as Jonathan Fairbanks and Elizabeth Bates put it in American Furniture: 1620 to the Present. This is partly because Gustav - along with Harvey Ellis, an architect who worked with him - seems to have been the true design originator; L. & J.G's pieces often seem derivative, appearing in their catalogs a year or two after Gustav's. Many antique experts also feel that Gustav's pieces are more elegant, more finely-tuned in proportion and detail. Sometimes, L & J.G. also used lesser-quality secondary woods. Gustav's decals: Gustave Stickley Company; United Crafts; and (most common) Craftsman Workshops, Eastwood, New York. Images include a joiner's compass with the words "Als ik Kan" ("if I can"), and his signature. L & J.G. 's decals: The Onondaga Shops, L & J.G Stickley, Fayetteville, N.Y; L. & J.G. Stickley, Handcraft; The Work of L & J.G. Stickley. Images include a joiner's hand screw. Gustav and L. & J.G. 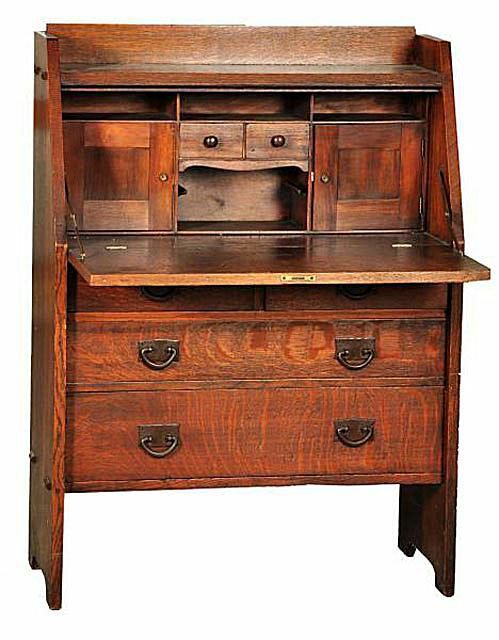 Stickley works are the most likely works antique collectors will encounter. But two other Stickley labels occasionally appear, reflecting the enterprises of two other Stickley brothers: Stickley & Brandt Chair Company, run by Charles Stickley, and Stickley Brothers Furniture Company of Grand Rapids, run by Albert Stickley.